The blog title is not a criticism of this place, but more a statement as to the fact that they have goat on the menu – something not seen that often on restaurant menus in the UK. In the UK, we love lamb (especially here in Wales), but goat is something (in my experience at least) that many people in the UK turn their noses up at. This is partly due to supply and demand – not many butchers have it, let alone supermarkets so it is a case of “not familiar with it, so not going to risk it” and if people aren’t going to order it, restaurants aren’t going to put it on their menus. There is also a strange squeamishness about eating goat. This I don’t get at all. I know people who have no qualms whatsoever about eating a multi- legged, eyes out on stalks, antenna wielding, externally armoured creature that wouldn’t look out of place in a sci fi movie (prawn, lobster, crab), but baulk at goat!! Others cry, but they are so cute – to those people I say, how cute is a lamb and I bet you eat them. Goat is, however, very popular in the Caribbean and I am quite partial to it (when prepared and cooked properly – it can be tough and dry when not). 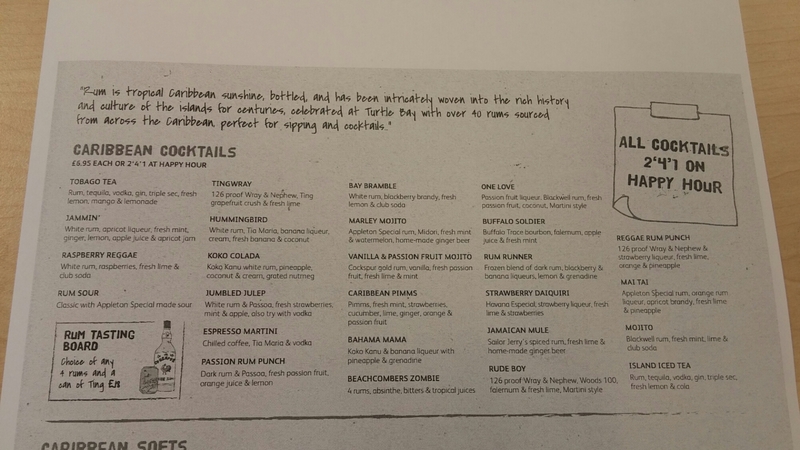 This brings me, in my usual roundabout way, to the Turtle Bay Caribbean Social – a new place in Cardiff, which has (as it is a Caribbean restaurant) to have goat on their menu (hence the “got my goat” title – which you will see I indeed did). 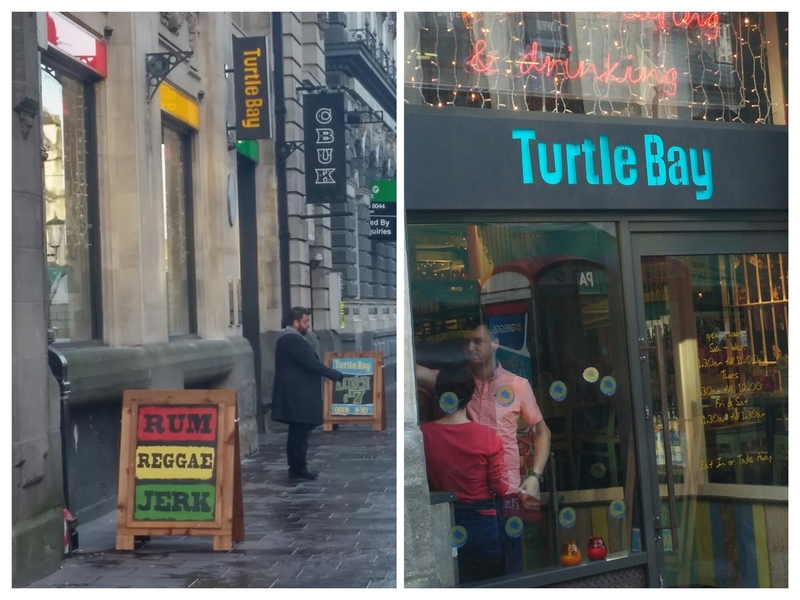 I am a big fan of Caribbean food and loved Jerkit in Cathays in Cardiff (need to get to Irie Shack down in Cardiff Bay), so for a pre Christmas lunch with J, Turtle Bay was the chosen venue. It is a surprisingly big unit (located in what was previously a Barclays bank), but despite its size it has a pleasing beach bar feel to it. I rather liked the interior. Nice relaxing sort of a place for a bite to eat or just a drink. The menu is split into various elements. 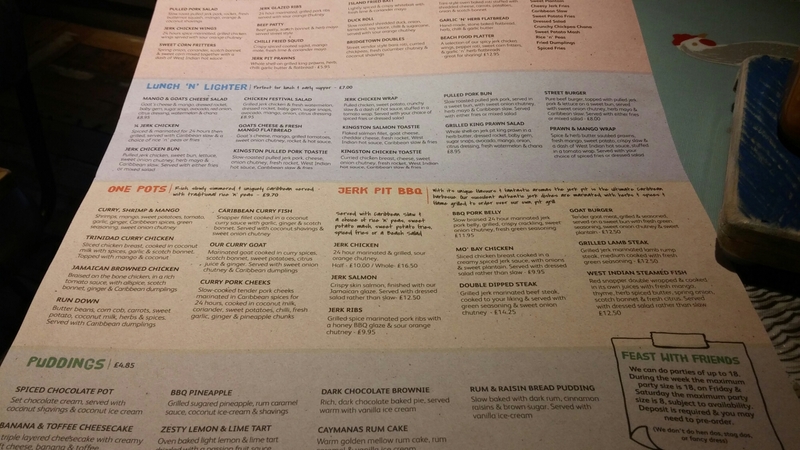 and is full of Caribbean classics (a point to note is the menu we were given differs in content and price in a number of areas to the one on their website). Cutters/starters (all £4.95 each) are sort of Caribbean tapas and ideal for nibbles with drinks on a night out I would say. They also have a lunch menu offering dishes (including a goat wrap with fries) for £7 which looks good value, as well as salads. Both J and I were, however, in the mood for something a bit more substantial. Me because I am pig and J because she was hungover. I was drawn to the “One Pot” dishes and as the post’s title suggests, I went for the goat curry (£9.65). This was a substantial dish with plenty of goat, sweet potatoes and rice and peas, all served up in a big pot in a lovely spicy sauce. The goat was beautifully tender and the whole dish had a pleasing chilli heat to it from the use of scotch bonnet chillis. Enough to make the lips tiggle, but not so much as to mask the spicing of the dish (thyme and ginger being to the fore). All in all a very tasty and satisfying pot of food, with a good chilli kick which didn’t obliterate the flavours of the dish. I found it quite hot, but suspect chilli fiends will not and you can add heat via the various hot sauces which are on the table. 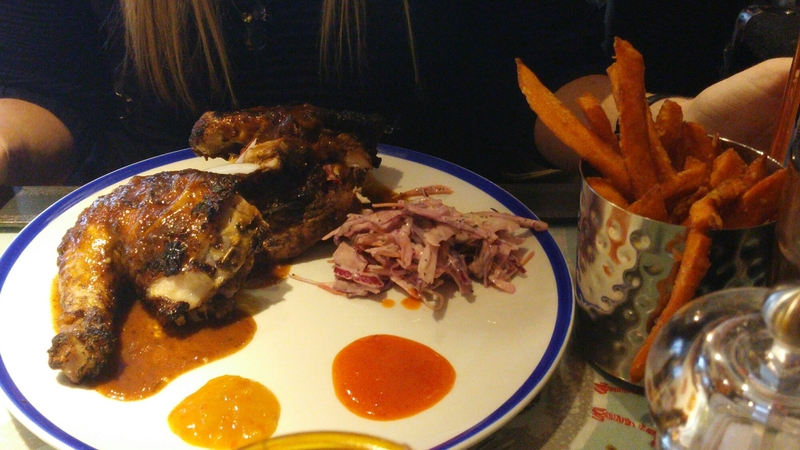 J went for, that other classic of Caribbean cooking, jerk BBQ in the form of a 1/2 jerk chicken (£9.95). This was pronounced as very tasty with again a nice kick to it. J, being much more of a chilli fiend than me added a variety of the hot sauces on the table to her chicken. 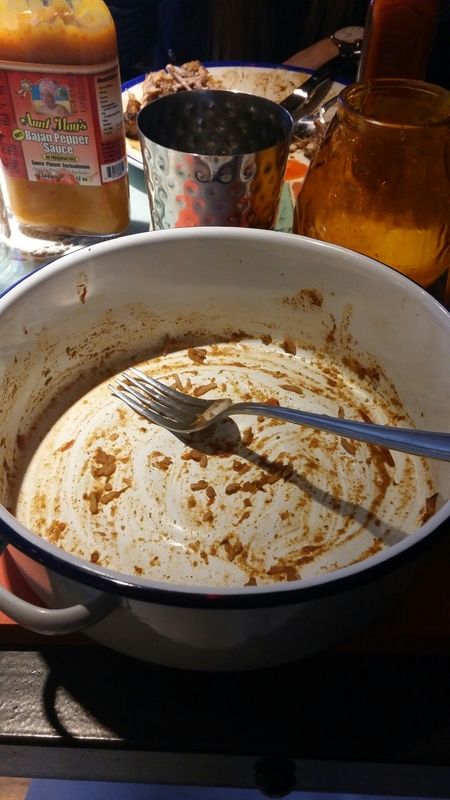 I had a taste of the chicken sans the hot sauce and it had a good flavour to it with cinnamon and nutmeg clearly identifiable over the heat. It came with some nicely seasoned, crispy sweet potato fries (the other option with this dish was sweet potato mash – I would have gone for that) and a very nice sour orange chutney. As we were both working, we were on the soft drinks. They have the usual sodas, but also some more interesting options such as pink lemonade, limeade and ginger beer (all homemade). J was boring and had diet coke (citing as her reason an imminent need for clothing with an elasticated waist band to get through Christmas). 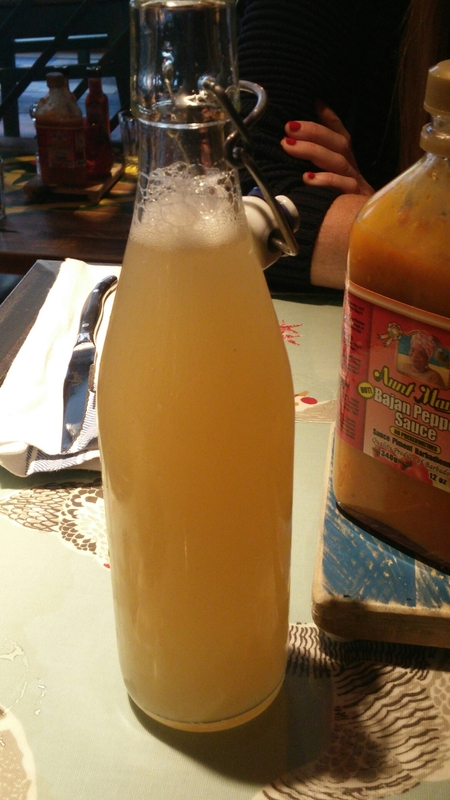 I was more adventurous, going for the homemade ginger beer (£3.55 – pricey, but it was a big bottle and probably enough for two). This, on paper and in the big bottle it came in, looked rather good. I love a nice spicy ginger beer, but flavour wise it lacked any real oomph with only a hint of ginger and no real heat. I got none of the promised spiced pepper, clove or fresh lime. Bit disappointing really. 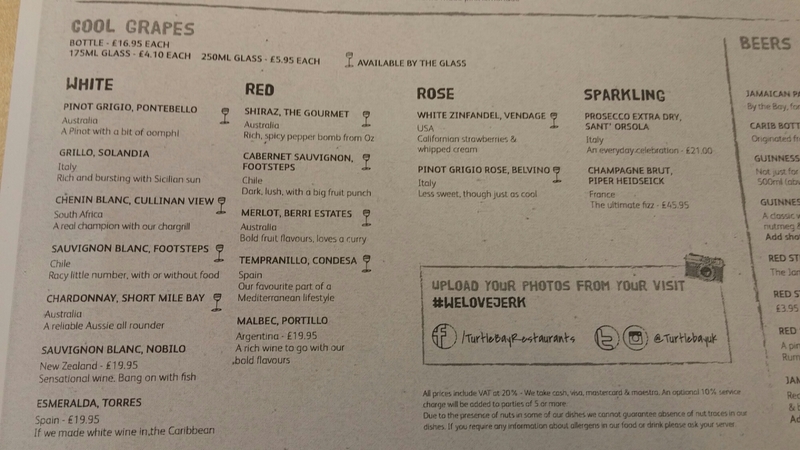 Wines are cheap (all bottles are £16.95), but the list is a tad pedestrian. 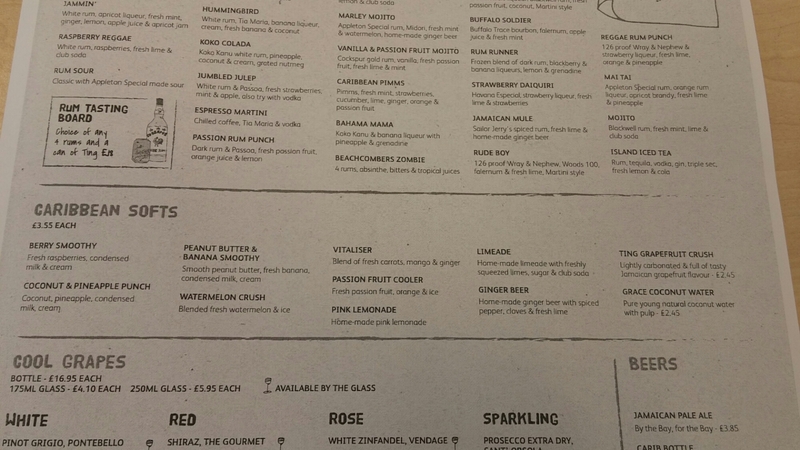 No riesling, gruner veltliner or gwertztraminer on the list which is what I would pair with the spicy food on offer here. Personally I would stick with a beer but if you want wine I would suggest for white, the chenin blanc or pinot grigio (not bad with spicy food) and if you go for red, the merlot (don’t want anything with too much tannin in it with spicy food, as they clash horribly). 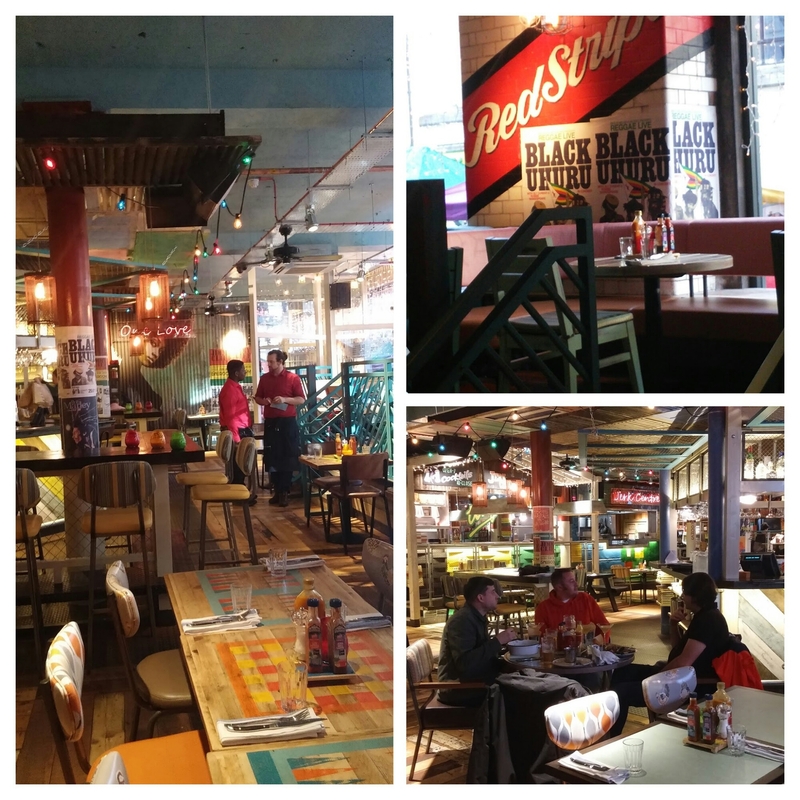 I rather liked Turtle Bay. 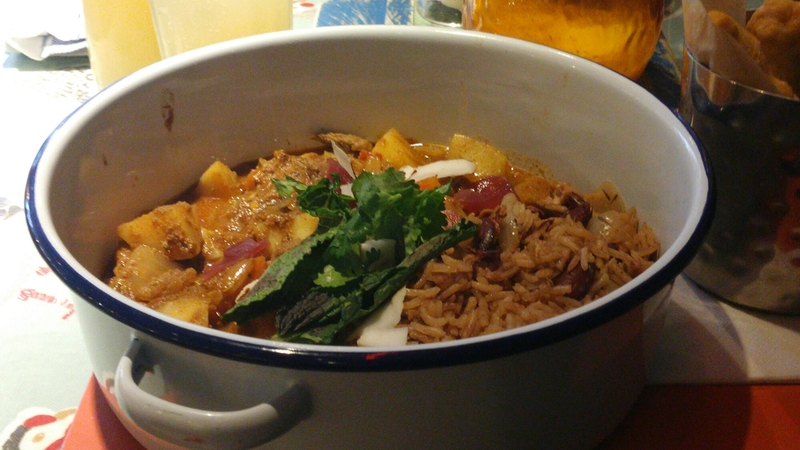 As the title suggested I did indeed get my goat and really enjoyed it in its curried form, as did J her jerk chicken. Both were fairly priced and nicely spiced. They had pleasant rather than mouth burning heat, which is to my particular taste. The bill (with drinks and a tip) came to £28, which I though OK value (for lunch and good value for dinner) for quality and quantity of food we got. Service was a little odd – our waiter was a touch on the over familiar side and expressed seemingly genuine amazement when I suggested I would like to pay the bill when he brought it over, by proffering my debit card. He said “What, you want to pay the bill now do you?” to which I reply “well yes” and then only after a rather embarrassingly long pause did he respond by saying “Oh right hmmm ok?”, which I thought a bit peculiar. Would I go back? Yes, I really liked the goat curry and am keen to try out their £7 lunch offer. I also rather fancy that Guinness punch with a shot of rum in it one evening (must be about 2000 calories a pop). 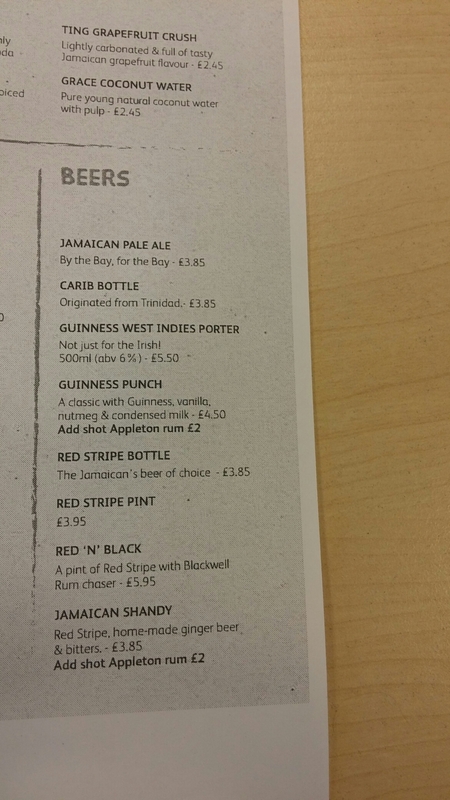 This entry was posted on Jan 3, 2016 by solicitingflavours in Alcoholic drink, Beer, Burger, burgers, Cardiff, Cardiff restaurant, Drink, Fast food, Fixed Price Menu, Food, Food and wine products, goat, Jamaican food, Jerk, Jerkit, lunch, lunchtime, New restaurant Cardiff, Non alcoholic drink, Red Wine, Restaurant Review, review, Turtle Bay, Turtle Bay Caribbean Social, Wales, wine.